What some Professionals have said about Retrievers ONLINE and our DVDs. Dave Rorem - "It’s an excellent publication. A lot of amateurs don’t realize the value of the training tips. I would highly recommend it." "Dennis' methods for training alone are a real plus for the amateur who doesn't have all the help that many professionals enjoy. But what's a real eye-opener for me is that some of the techniques are actually so effective that they are sometimes better than having the big set-ups with multiple marks." Bill Hillmann- Bill has provided video testimonials and comment about our DVDs on his Blog (see here) . For comments on Training Retrievers Alone see here: for comments on 25 Essential Drills DVD see here; for comments on my "Donut Theory" see here. The late Rex Carr - "I was impressed with the substance . . . and the desire to reach beyond where you are." "It’s hard to imagine how ONLINE could improve." "A terrific job for the retriever community." "I can’t begin to tell you how much enjoyment I gain from reading ONLINE. The articles are great." "I think ONLINE is outstanding when compared to the other glossy-covered magazines I’ve read!" "ONLINE is a major contribution to the game." 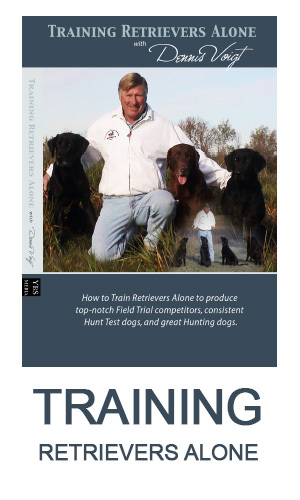 Google anything you can find on "Stand Alones" and particularly anything written by Dennis Voigt (who wrote the book on Training Retrievers Alone, literally). Also check out back issues of Retrievers ONLINE which is loaded with suggestions on the subject. The point Voigt makes frequently is that there are some things the "lonely amateur" can do that are an advantage over just doing big set-ups with a gaggle of training partners and dogs. Not a complete substitute, but an amazing amount of good you can do on your own. 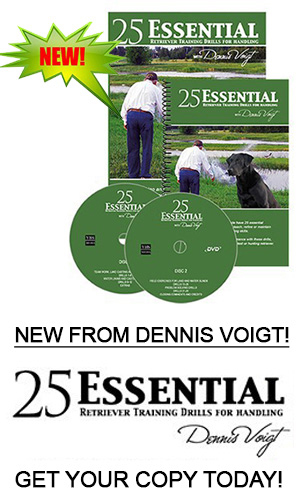 Today we have the internet, RTF, lots of good programs on DVD and Dennis Voigt’s wonderful monthly " Retrievers ONLINE”. A very successful competitor, trainer, teacher & publisher of Retrievers ONLINE. Dennis Voigt gives a very well thought out seminar & is an excellent instructor. Retrievers ONLINE: Thank you Dennis and Fiona for helping to make us all better trainers. I thank you and my dogs thank you, keep up the good work. Your latest issue is truly outstanding, Happy 25 th Anniversary! I'm an amateur that trains his own dogs. I started just a year or so after "LRCO ONLINE" got going. This publication has been the most important resource this amateur can think of. Highly motivational. Congrats on 25 yrs of Retrievers ONLINE. I got my first issues (happily, all 4 issues from 2013). Started in on them right away and then took them on the plane with me where I picked up my new puppy. It was a 20 hour ordeal that pup handled great. Me, not so much. But I consumed the RO's all the way. They are GREAT! Wish I'd gotten a subscription years ago. Retrievers ONLINE! It's all about Retriever training......and worth every penny! If you want to learn how to train your own dog, I'd study everything written or put on DVD by Mike Lardy and Dennis Voigt. Dennis Voigt's 25 Essential Drills is outstanding at this stage of your training. I highly recommend it. I have just concluded my review of the 25 Essential Drills DVDs. It took me four sessions as I wanted to study the drills as I went along rather than just scan through them. I have found your videos . . .just so insightful. I just can't thank you enough for the insight that you all have given me so I can train my dogs and run them in hunting and tests with so much less collar correction. I find I nick very seldom any more (and when I do, it is with much lower intensity) and do lots more "no-no's". The dogs are so happy, jumping around and wagging tails and just having a ball. What a gift you have given the rest of us.....many thanks! Dennis is clearly a master at teaching new concepts to both young and advanced retrievers! Note: In December 2015, Dennis gave a Workshop in New Zealand. The Trainers there eagerly devoured and study much of the new material I presented to the. They have been enjoying great success in competition in the ensuing field trial season. Here is a testimonial from their Facebook page. "What a week for training group members. Bint is now a FTCh, and not yet 2.5 yr old. Ted is sitting on 5 challenge points and needs only one more for his title and Cruz picked up his first. Not to mention all the placings gained by our minor dogs and Teresa's Traveller coming out and competing well at open level. Personally I want to thank Dennis Voigt. It is Dennis' drills and insights that have put the polish on Bint's marking and lines. Our training became much more focused... and beneficial as a result of what I picked up at the seminar.I have been able to achieve this without denting Bint's confidence. I encourage everyone to carry on with the program and to have confidence that your training will achieve the results that I have experienced. Even Bint and Ted's mother, Tat, has benefited. She picked up a challenge point last week as well and I believe her increased focus and steady behaviour on the peg is due to the changes we have made to the way in which we train. Thanks to everyone for your support and special thanks to Teresa Borrell for organising the seminar last year.